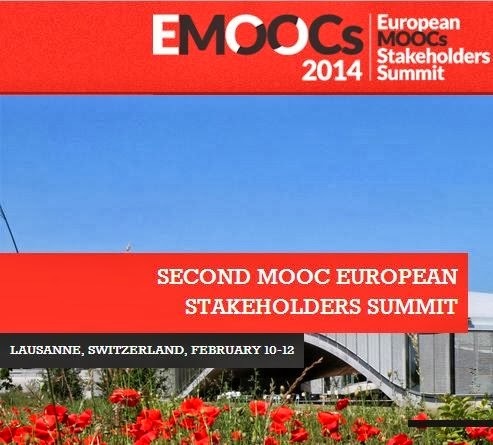 The MOOC 2014 conference took place at EPFL in Lausanne Switzerland in February 2014. The catchphrase of the conference was "All you need to know about MOOCs". In the introduction, conference chair Pierre Dillenbourg asked the participants not ask "what can MOOCs do" but rather "what should MOOCs do". Currently, MOOCs are mostly developed for higher education and further education. However, the corporate and vocational training market is much larger than higher education. Several initiatives are developing MOOCs for corporate (COOCs) and vocational training (VOOC), e.g. customer training. Open question: Can MOOCs be used to teach physical skills, eg vocational skill, sport? If companies do their own testing and training, what are universities still needed for? Mostly Western countries and mostly people who already have a higher degree (master or higher): MOOC as a form of further education (but not initial education). Should MOOCs in developing countries be seen as a form of cultural colonialism or a democratization of education? How can MOOCs advance new forms of pedagogy instead of being glorified video lectures? Open question: Are xMOOCs actually different from existing eLearning platforms (besides the larger user numbers)? [Siemen's and Downes' cMOOCs differentiated themselves through their connectivist pedagogy, but what about xMOOCs?]. Suggestion: Go beyond the university-semester model -> Trend towards shorter courses (as people don't have much time). The conference presentations offered a plethora of new terms: SOOCs and BOOCs (Small and Big open online courses (Is a MOOC with fewer participants still a MOOC? ), COOCs (MOOCs for corporate training), VOOCs (MOOCs for vocational training), pMOOCs (project-based MOOCS), DOCC (Distance open collaborative course), etc. New forms of awards are needed. Gamification of education: badges. Currently, no university or employer accepts MOOC credits, but some allow complementing with on-campus courses to get credit. Some (few) employers recognize MOOC certificates on CVs. Trend towards certification of MOOCs by professional organizations (rather than universities). xMOOC companies (like EdX and Coursera) offer "premium track" models in which participants pay a fee in advance to get access to the final exam and get a certificate. Users in the premium track have a completion rate of up to 70% (which is much higher than regular MOOC participation). The increase could be explained by economic motivation to get your moneys worth and a selection effect as only motivated participants are willing to pay in the first place. I created a brief overview of MOOCs in the dynamic mindmap below [Click on a term to read the attached notes in the window below].